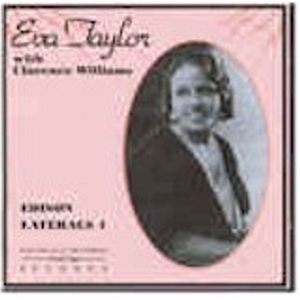 Eva Taylor/Clarence Williams - Edison Laterals 4 CD - Tracer Technologies Inc.
Eva Taylor belongs to the great tradition of vaudeville singers who were such a vital part of the jazz scene during the first half of the twentieth century. Born in 1895, she made her public debut at age 2 ? as a child performer in a touring show. Eva Taylor made a large number of records with Clarence Williams from 1922 into the 1930?s. Among them are the 1924 and 1925 sides by the Blue Five which are notable for the inclusion of Louis Armstrong and Sidney Bechet. Eva Taylor and Clarence Williams recorded for Edison from July to October of 1929, but the company stopped all recording on October 19, 1929. This is why this very fine group of recordings was never issued by Edison. In 1976, Eva Taylor, then in her 80's, visited the Edison National Historic Site and heard, for the first time, one of the recordings which she had made in 1929 but had never been released. Her reaction to this event is captured on this CD, along with a mini-concert which she performed at that time, and on another date the following year. *These live recordings were part of a series of programs created by Leah Burt and Raymond Wile in the 1970?s in which some of the original Edison artists were invited to the Edison National Historic Site to perform.